A new competition format proposed for introduction at the 2022 Youth Olympic Games has successfully passed its first test. 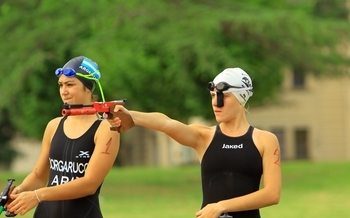 New Tetrathlon, which adds Fencing to the established development sport of Triathle (Shooting/Swimming/Running), was tested by pentathletes in Buenos Aires, Argentina on March 16. The aim of the new format is to make the competition more dynamic and exciting for athletes and spectators, with a more compact field of play, a smoother flow and closer alignment with the development path of the UIPM Sports Pyramid. UIPM’s goal is to use the new format for the 4th Youth Olympic Games in Dakar, Senegal in 2022 – the first Olympic Games to be held in Africa. The proposed changes – which would replace the traditional Tetrathlon format of Swimming, Fencing and Laser Run – are also in line with strategic guidance from the International Olympic Committee to “continue to use the YOG as an incubator for innovation”. On March 16, 40 male and female athletes – mostly pentathletes – took part in the historic New Tetrathlon test at the National Military College in Buenos Aires. A detailed report was sent to the UIPM Executive Board and members of the Athletes, Coaches, Medical and Technical Committees and four more test events will follow. The results of each event will be analysed in detail by a working group set up after the joint UIPM committees meeting in Frankfurt (GER) in January 2019. A final report will then be submitted to the Executive Board, which will lead the decision-making process about the new format in September 2019. UIPM President Dr Klaus Schormann said: “Modern Pentathlon has been a central part of the success of the first three Youth Olympic Summer Games in Singapore (2010), Nanjing (2014) and Buenos Aires (2018) and the traditional Tetrathlon format has served us well during these Games.